WASHINGTON — Travelers heading to Reagan National Airport Friday afternoon and evening were seeing red — literally. 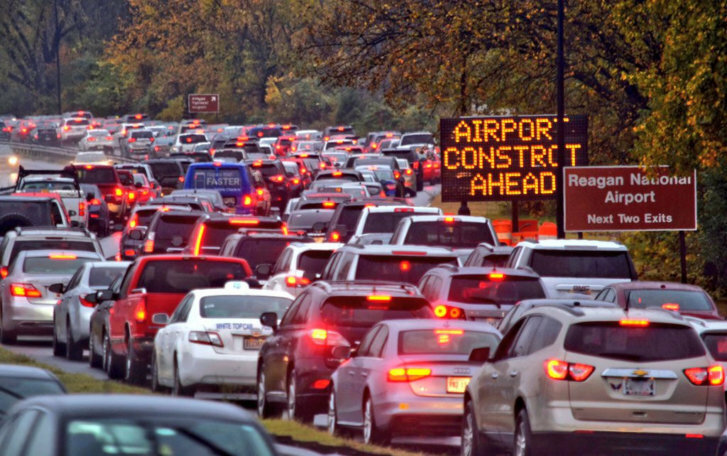 The messy combination of wet weather, airport construction and a four-day shutdown of the Metro stop that services the airport led to a sea of brake lights on the George Washington Parkway as traffic inched through extreme delays. Major backups were reported on the George Washington Parkway and Route 1 Friday afternoon and continued through the evening. ⚠ Traffic is gridlocked at the airport due to @wmata’s shutdown of 2 stations, including ours. Metro’s free shuttles are also facing long wait times. We apologize for any inconvenience during this regional traffic issue. Passengers should leave extra time coming to the airport. Delays on the GW Parkway heading southbound backed up all the way to the Memorial Bridge, according to the WTOP Traffic Center. Metro passengers were also treated to a frustrating commute. The Crystal City and Reagan National Airport Metro stations on the Yellow and Blue Lines are closed through the end of the long Veterans Day weekend for maintenance. The closure was well-publicized, although many travelers took to social media to vent their frustration about both the shuttered service and the long waits for shuttle buses. The traffic headaches were expected but still seemed to catch many drivers off-guard. Airport authorities had been expecting the roads near the airport to be more congested than usual this weekend, with more travelers driving to the terminals instead of taking Metro. During similar Metro closures, long backups have formed at times on the George Washington Parkway and Route 1 in Crystal City. Yingling urged airport travelers who are arriving late in the evening to consider picking up passengers on the upper level. “If they’re coming in on a flight after 8 p.m. the ticketing level roadway is often pretty quiet at that time,” he said.